Since the moment your child was born, your no. 1 job was simple: Keep this little person alive. As you began navigating the maze of parenthood, grasping the complexities of feeding and nutrition likely felt overwhelming. It turns out, how you nourish your child is a journey that doesn’t end until, well … ever. Your influence may wane, but your desire to ensure your child makes smart, healthy choices won’t. Here are a few helpful hints on how to manage and prevent some of the most common feeding challenges from turning into bigger problems. Some picky eaters are born, but most are made. Adults contribute to this behavior by giving in and catering to their children’s desires for a limited diet of favorites, such as mac ’n’ cheese, quesadillas and chicken nuggets. Sound familiar? Rare is the child who will eat pretty much anything, but a willingness to take risks in eating is something that can be nurtured. If adults can influence picky eating habits, then it is also possible for them to help children expand their palate. So, what is a parent to do with a “picky” eater? 1) Stop labeling the behavior. The label “picky” is destined to become a self-fulfilling prophecy. When talking about your child’s preferences, focus on using language that encourages your child to take more risks in eating. Lose the term “picky” all together and change words like “always,” “never” and “all the time” to “can be” or “is learning to” when talking about your child’s tendencies. 2) Introduce new foods, while offering one or two familiar foods at each meal. “Children tend to take more risks when new foods are accompanied with safe and familiar ones,” Olden says. 3) Encourage experimentation. Let your child lick the food, rest the food in her mouth, or chew it and even politely spit it out. If you allow your child to spit out food she doesn’t like, she is actually more likely to try it again. Children have stronger taste buds, which can overwhelm their palate. It may take a while for them to get accustomed to less familiar or pungent tastes. “On average, there must be at least 21 introductions of a new food before a child eats and enjoys it,” Olden says. My child does not stop eating! Or, My child does not eat enough! Eating is instinctual. If we listen to our bodies, we will know what, when and how much to eat. 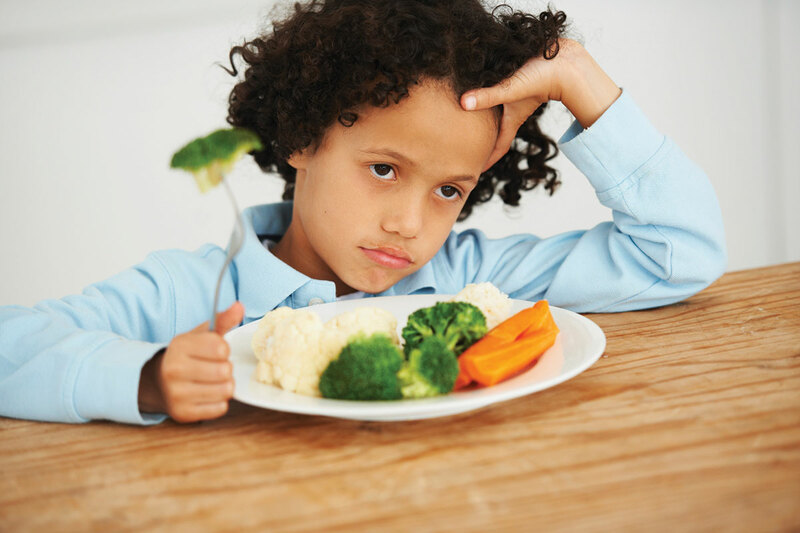 When we interfere with a child’s ability to distinguish hunger and fullness, we interfere with healthy eating habits. Have you ever witnessed a young child being forced, prodded or manipulated into eating a meal or snack? Well-intentioned parents can interfere with a child’s ability to read his body’s signals of hunger and fullness. When children lose the ability to read these signals coming from their brain, they often adopt unhealthy eating habits. So what can we do to avoid having our children eat too much or not enough? 1) Notice the big picture before becoming too concerned. First, acknowledge that there are numerous factors that can influence a child’s eating habits. Children grow in spurts, and their growth will significantly affect the amount of food they will or won’t consume. They also tend to eat more when physically active and less when sedentary. 2) Empower your children. Relinquish control and allow them to serve themselves. They will take what they need. If you are serving them, you are presuming you know how much they need to feel satisfied and full. If a child places a less desirable food on her plate, she is more likely to eat it than if you had placed it there for her. 3) Involve your children in shopping for foods that they can have without any restrictions. Allow them to choose some of the proteins, veggies and fruits they will eat for lunch and/or dinner. Again, their selection of foods will increase the likelihood that they consume them. Phones and tablets interfere with healthy, intuitive eating and create unnecessary challenges for parents. Recent research conducted in the U.K. found that one-third of children are engaged with technology at the dinner table. Not only are these devices getting in the way of families connecting socially, but they may also be contributing to weight gain. In the April 2013 issue of The American Journal of Clinical Nutrition, one study found that being distracted by a screen during a meal tended to make people eat more at that meal, and that paying attention to a meal was actually linked to eating less later on. Screens contribute to altering children’s intuitive eating signals. How do we manage technology around mealtimes? 1) Pull up a seat! If you are not eating with your children and engaging with them, you can expect for them to look elsewhere for entertainment. This may sound obvious, but modeling what it looks like to sit and eat a meal will increase the likelihood that your children will sit and eat the healthy foods you have prepared for them. Showing up device-free will communicate your values and help your children to regulate their own behaviors. 2) Set limits and communicate expectations ahead of time. Establish when your children can use technology and where they can interact with it. Involve children in the formation of your family’s policy to get their buy-in, and have a discussion about the sanctity of the dinner table and the importance of being screen-free. Limits should pertain to everyone in the family, not just children. Feeding children doesn’t have to be as complex as we make it. Many of the issues we create in our quest to do our best for our children can be overcome or avoided. Success will come from modeling the right behaviors, making meal planning and preparation more cooperative, and allowing your children to be intuitive eaters. Creating the right feeding and nutrition habits in early childhood will set the stage for when they are out of view of your watchful eye. Maybe they will even gobble up kale and broccoli one day!